2. 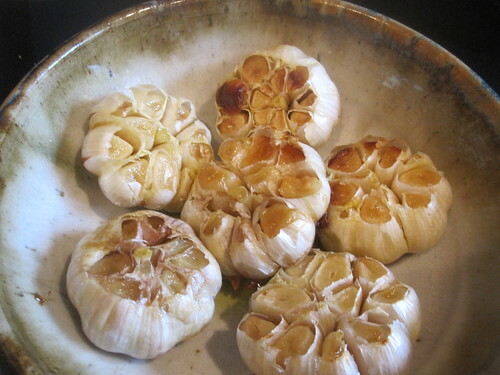 Peel away the outer layers of the garlic bulb skin, leaving the skins of the individual cloves intact. Using a knife, cut off 1/4 off the top of cloves, exposing the individual cloves of garlic. 3. Place the garlic heads in a baking pan. Drizzle a couple teaspoons of olive oil over each head, using your fingers to make sure the garlic head is well coated. Cover with aluminum foil. Bake at 400°F for 40 – 45 minutes, or until the cloves feel soft when pressed. 4 Allow the garlic to cool enough so you can touch it without burning yourself. squeeze the roasted garlic cloves out of their skins onto your favorite bread and enjoy.